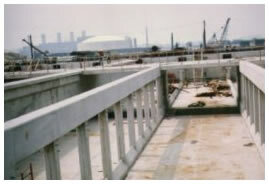 Custom engineered FRP Formwork designed & furnished by SCI used to form the concrete "Dog House" beams, columns and cap beams on this large sewage treatment facility. 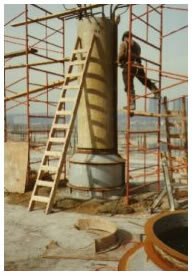 These beams & columns facilitate the mounting of the mechanical skimming equipment in the sedimentation tanks pictured here. 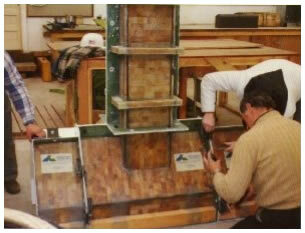 The FRP forms were modular in design, which allowed the contractor to add and or remove beam form sections as required to produce appropriate lengths. SCI uses precise state of the art manufacturing methods and on-site supervision which ensures complete understanding of all equipment and systems. 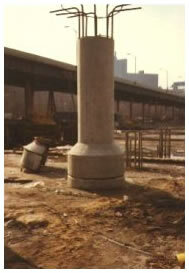 SCI provided custom FRP (Fiberglass Reinforced Plastic) Column Forms and custom steel forms (Base section) for these "Elephant Foot" columns on a major wastewater treatment facility in the United States.